Sports Therapy is a medical profession that focusses upon injury prevention and patient rehabilitation to their optimal level of function whether occupational, sporting or day to day ability. There is no discrimination against age, gender or ability, and you do not need to be an athlete to benefit from their expertise. Sports therapists use a multi-disciplinary approach to assess and diagnose your problem then implement the best treatment programme to return you to full function in the shortest, safest time possible. Treatment methods used by sports therapists include manual therapy, sports massage, acupuncture, electrotherapy, patient specific rehabilitation programmes, biomechanical/postural assessment and kinesio taping. Most treatment modalities are used in combination in accelerate healing and prevent recurrence of injury. Your first session will last between 45 minutes and an hour and will begin by the therapist taking a full history of your current condition as well as any other relevant information. The next stage will involve a full physical assessment of your injury to pin point the cause followed by any appropriate treatment modalities. You will then be advised upfront on an approximate recovery time and how many follow up sessions maybe required. During the physical examination and treatment parts of your session you will be required to remove some items of clothing, to enable a full assessment of the problem. If you are uncomfortable about removing your clothing a pair of shorts and a sports bra/vest top for women may be more comfortable for you. Please speak to your therapist before your session is you are concerned or have any questions. Cat graduated from the University of Chichester in 2009 with a BSc (Hons) degree in Sports Therapy and is a fully registered member of the Society of Sports Therapists. She joined the Fir Tree Clinic in 2010 after returning home to Reading and is passionate to return patients to full function as quickly and as safely as possible. Treating a variety of patients she is able to tailor rehabilitation to suit the individual whether you are aiming to run a marathon, or just be able to walk the dog without being in pain. Since graduation Cat has been involved in a number of different sports from working, spectating and participating aspects with examples including completing a London to Paris bike ride in 2010, providing medical assistance on a 2 Wheels 3 Peaks charity challenge in 2012 and planning a round the Isle of Wight walk for 2013. She therefore finds that her own involvement helps her to understand the demands of an athlete’s sport more clearly, and tailor their rehabilitation to suit their needs more efficiently. Working closely with patients to ascertain their expectations and goals significantly improves patient outcome. A keen rugby enthusiast, Cat is currently working at Reading Rugby Club providing training night treatment sessions, rehabilitation classes, pitchside assistance for the 1st XV and co-ordinating youth medical cover provision. 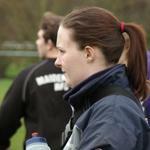 She also runs a franchise of the children’s rugby skill based play programme Rugbytots, for pre schoolers. Since completing her degree Cat has furthered her knowledge by completing regular Continued Professional Development to keep up to date with current research and treatment protocols. In the future she is looking to widen this with a master’s degree in sports rehabilitation.